An “Arduino” is a micro-controller that really makes robotics a lot easier and fun to create. 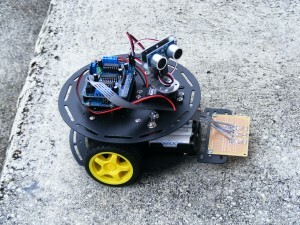 First designed in 2005 by an Italian company, these single boards were originally intended for students learning robotics. The board consists of standardized connectors, which allow a whole host of interchangeable add-on modules (shields) to be used. It’s like the brains of a computer that you can add inputs (like sensors) and outputs connections (like motors) to. Arduinos are not limited to student robotics. In fact, you’ll find them anywhere there’s automation, from telescope observatories to weather stations to smart home functions. We’re going to learn how to transform an inexpensive Arduino board into a fully functioning autonomous robot with sensors, just like the one in the image above. This will take several steps, so watch the videos in order so you don’t miss a thing. In this video we’ll show you how to build the motor shield which is used to control the motors of the 2 wheel robot. We’ll also show you some tips and tricks for soldering that are useful skills for any soldering project. Now it’s time to build the chassis. We will cover every aspect of the assembling the chassis and solve a few problem along the way. Since the line sensor will be constructed using a generic prototyping PC board, a lot of issues are discovered and solved during the build. A number of design changes are covered in this video dealing mostly with simplifying the line sensor build itself, and solving a connection problem between the line sensor cable and the motor shield. Additional pin strip header will be used in this video to solve one problem. This video covers the installation of the Arduino IDE, driver for the Arduino Leonardo, Install sketch libraries for the robot, test the Arduino with a simple LED blinking program, and then test the motors and the line sensor to make sure they are working correctly. This video covers building up the PING sensor, installing it into the robot, and then testing both the servo motor and PING sensor to make sure they are working correctly.